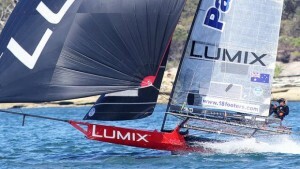 One of the most enthusiastic 18ft Skiff sailors in the world must be the Northern California-based Katie Love, who is presently spending the 2018-2019 Australian summer as skipper of the Panasonic Lumix-sponsored boat in the Australian 18 Footers League fleet on Sydney Harbor. Like almost every young sailor in Southern California, Katie began her sailing career in a Sabot then moved up through the ranks of sailboat racing, progressing through the different boat types raced by age group, and sailed the Junior Women’s Single-handed National Championships when she was thirteen years old. Beginning in San Diego, Katie’s enthusiasm for sailing, and the adrenaline rush of high-speed excitement, soon led her north, in 2009, to the fledgling 18s fleet in San Francisco. She has since competed in seven San Francisco 18’ Skiff International regattas. In the 2010 International 18 Foot Skiff Regatta in San Francisco, Katie realized this goal when she led an all-girl team of Mallory McCollum-Bozina and Yvonne Galvez on the former Australian Grand Prix 18, named Prudential. Katie’s all-girl, pink 18 raced as Chad’s Angels but was affectionately known by the locals as the Love Machine. 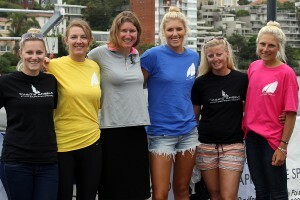 In 2013, Katie led the first all-girl team to contest a JJ Giltinan Championship contest, the unofficial world title for the 18ft Skiff, the same year as Australia’s Alexandra South also led the first all-girl team (below). Katie’s team, which raced as Chad’s Angels at the 2013 JJs, included Christine Neville and CC Childers. Both the US and Australian female teams performed well against the cream of the world’s best 18ft Skiff teams. It was that experience which made sailing an 18 on Sydney Harbor something Katie wanted to do again, if the opportunity ever came her way again. Just weeks before the start of the 2018-2019 Season, Katie made contact with the League to see if it was possible to “live her dream” and spend the full summer season in Australia’s premier 18ft Skiff fleet. Former Giltinan champion and League Club President, John (Woody) Winning knew Katie from his International Championship regattas in San Francisco, her ability to drive a skiff hard on the demanding San Francisco track, and her enthusiasm for the sport, and immediately organized a boat for her to sail. Along with local skipper, Yvette Heritage, these two young ladies are proving they are willing and able to match their skills against the more-experienced male competitors and they are adding a great new dimension to the local fleet. Katie is making the most of her time while she’s in Sydney and recently went for a sail one of the Historical 18s (1950s style boats) which also race each week on Sydney Harbor. “Ever since I sailed the JJ’s in 2013, I have been eagerly trying to get back to Sydney to compete in the 18’s, but due to life responsibilities, I have only now made it back, but I couldn’t be more excited,” shared Katie. “I have been working extremely hard on tug-boats for the last 8 years and have barely had anytime to myself or sailing. Over the last few years I have spent roughly 240 days per year at sea, as work and responsibility completely took over the time I had for sailing, which is not how I wanted my life to be. 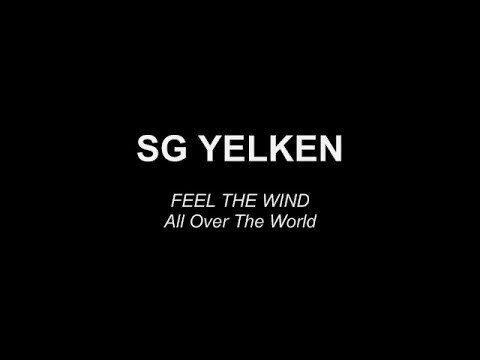 “I have decided to take a break from the tug world and pursue my dream of sailing the 18 Season, and I really appreciate the warm welcome back to Sydney. I love this place and love being part of the League. Katie, alongside crew James Patterson and Lachlan Alexander, are showing the attitude and ability to achieve their goals, and the League officials are confident they made the right decision when they agreed to include Katie Love in their 2018-2019 Season fleet. Aside from her sailing career, Katie still spends most of her time on the water, as a Captain with a tug boat company in Seattle, Washington, docking ships in the harbor. Katie recalls that it was while she was in high school that she decided to start making boats her career: “I worked on old America’s Cup sailboats, taking tourists out for ‘three hour tours’ on the bay; I worked on a Pacemaker 70ft private dinner charter boat that required me to wear a dress and heels as a deckhand. “I worked at the yacht club, teaching kids how to sail, and taught adults how to sail at an adult sailing school. I was also hired by many people to race on their boats, and went fishing whenever I could. It was then, my cousin told me about the California Maritime Academy, which is a college for people who love boats. “I moved up from AB to AB/Tanker-woman, then to 2nd Mate/Cargo Mate, Chief Mate, and now Captain. I am currently a 2nd Captain at Foss Maritime, and couldn’t be happier: these are my people. I now hold a 1600 ton Masters license/Unlimited 2nd Mate, Oceans. Clearly, any male in the industry that thought Katie wasn’t a match for them, was making a very big mistake.